[continued from page 2] ...did not have sexual relations with that Scout' said Grand Master Azrael in a written statement. Inquisition prosecutors are now pinning their hopes on test results from the notorious stained robe. IE: Miss Hesperax, tell us a bit about your early career. LH: There isn't really much to tell. By the time I was 12 of your Terran years I had murdered all who stood in my way and become Queen of my Cult. You know, people think that sudden fame just happens, but it takes years of hard work before you get any recognition. IE: What do you think of the Imperium's hard-line policy against acknowledging the existence of aliens? LH: It's their own people they're harming. People here in Commorragh go home from the Arenas - those that don't die there - feeling satisfied and fulfilled, and are much more willing to contribute to our society because they can see the benefits for themselves. Admittedly the human contribution is generally to die messily, but I think if the people of the Imperium were allowed to know about us it would enrich their lives. Add a little vibrant blood red to the tapestry of existence, you know? I think a lot of the problems humans have stem from the Imperium's puritan attitude. Apart from your lovely publication, of course. IE: Well, they keep trying to shut us down. Now tell us, the question everyone in the Imperium has been asking: have you ever had enhancement surgery? LH: No. I know you're just doing your job, but these rumours are just maddening. I've had an internal combat drug injector installed - it's so passe wearing it on your belt, and it ruins the look of your armour - but that's it. All this talk of implanted venom fangs and sub-dermal electro-fields is ridiculous. I believe you've got to do your best with what nature gave you. IE: As you mention combat drugs, there's been a bit of a scandal about drugs in the Cults lately. What's your stance? LH: Zero tolerance. I know it's fashionable nowadays to talk about rehabilitation and harm minimization, but I don't go in for any of that crap. If one of my Wyches is found to be taking less than the required amount of stims and amphetamines, they're Warp Beast fodder, no excuses. Just say 'no' to going clean, it's that simple. 41st MILLENNIUM LIVING - DO YOU WANT TO KNOW MORE? FERROBEAST: Good news on the employment front, as your overseer decides to lay off the whip for a few days. Now would be a good time to stock up on rations, as there's a possibility of starving to death in the next few weeks due to a bureaucratic oversight in the food distribution area. GROX: Think about moving out of town, as an Imperial Guard recruitment agent and an Ork horde will be arriving on your world in quick succession. If you work on a starship, avoid airlocks this week. THE CLONES: If you survived last week's meteor shower prediction, it's time to take stock of your life and prepare for the future. Give a little extra to the Church this week - mass attendances are flagging, and they're going to be looking for any weak links to execute as heretics at the next meeting. CARNIFEX: The possibility of losing your job this week. Don't despair, look for a position in the military supply sector, it's always growing. Be wary of cultists with abnormal numbers of arms. CATACHAN DEVIL: If you live on a hiveworld, try to look more unhealthy than usual. Your stars indicate that an organ harvesting team may visit your neighbourhood, and you don't want to look tempting, do you? BATTLE SISTER: Rejoice in having a cooler starsign than everyone else, just like IE's astrology editor is doing. And, just like the last 157 weeks, anyone who gives you trouble will meet a hideous fate, so everyone else: don't mess with us, okay? THE ASTRONOMICAN: Possible trouble with the Adeptus Arbites this week. Just speak only when spoken to, call everyone 'sir', and eagerly offer to betray your friends and family in exchange for your life. LASHWORM: If you wake up with a hangover and no memory of the previous night, check yourself for the symbols of evil daemonic entities. Sometimes, you party too hard. PTERRASQUIRREL: For those of you in the military, the stars say it's not just your imagination, it's a Lictor. Remember, you only need to outrun your squadmates and you'll be safe. VENUS MAN TRAP: If you're thinking of joining a heretic pleasure cult, go for it. The Inquisition's going to virus-bomb your planet in a few days anyway, so what the hell. RIPPYFISH: A special warning for Blood Angels of this sign - try not to get too worked up in battle, there's a high chance of Black Rage this week. For the rest of you, try not to worry about shooting stars unless one lands near your village and livestock starts vanishing. CUDBEAR: If you're living with a secret psychic power, be on your guard this week. Chances are any inadvertant telekinesis or temporal manipulation could be spotted by an Inquisition agent. Just do things the old-fashioned way for a while. The Overlord class battlecruiser. Sleek. Dynamic. Aggressive. The only choice for system defence, now at a reduced price. Don't put the lives of your family on the line. 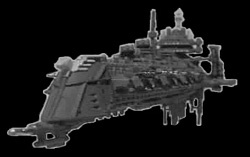 Petition your planetary governor to purchase an Overlord class battlecruiser today. It's an investment in your future. LIVING IT UP ON THE DEATHWORLD! Are you tired of visiting the same boring agri-world every year? You want something different, something you'll remember for the rest of your life? This season's tourists evidently are, because they're flocking to the death world Catachan for the experience of an often-truncated lifetime. Imperial supply vessels run from most major port world to Catachan every week. As always the prohibition against civilian space travel means you'll have to stow away or bribe someone, but as an experienced tourist you'll be used to all that. When you land you'll be surrounded by a vast, living jungle the likes of which you've never seen before. Don't stray off the paths, and if you're visiting during the springtime, better take a flamethrower and power field just in case - the nightlife gets a little restless. Most people think 'jungle' when they think of Catachan, but don't overlook the magnificent beaches. Still largely unspoilt by excess tourist development, you'll be able to lounge around for hours with only the lapping of the waves and the occasional screams of unlucky jungle wildlife to keep you company. The Catachan Tourism Board recommends against swimming, as the local marine life is feeling frisky this decade, and can eat through power armour in three seconds. Prices for tourist accomodation are kept low by the high mortality rate, so you can afford the best the planet has to offer. Insist on plascrete walls for your bedroom-bunker - some cheapskate tourists find out the hard way that steel just doesn't count against a determined Catachan Devil. TRAVEL - DO YOU WANT TO KNOW MORE? 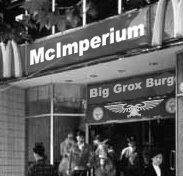 For a good time and great food, come to your local McImperium restaurant. Try our new Termagant Tasties snacks, or just go for a good old-fashioned Big Grox burger. Now with outlets on over 975,108 worlds!